Tired of drinking contaminant-filled tap water? Then take a look at the 5 top alkaline pitchers that will ensure you never have to again. We all know just how important it is to drink plenty of water on a daily basis but the water that you get from your taps is sometimes far from being healthy. Tap water can contain numerous contaminants such as heavy metals, fluorine and pesticides that are known to be damaging to our health. Alkaline water is widely thought to be beneficial to our health but while buying it in plastic bottles is better for us, those plastic bottles are just going to add to the damage that we are doing to the environment. A better alternative is to buy a pH enhancing water pitcher that you can use at home to cleanse your tap water of those contaminants, enrich it with minerals and antioxidants and increase its healthy pH levels. What are the Health Benefits of Using Alkaline Water Filters? There are literally dozens of pitchers out there to choose from but just like any other kitchen accessory that you are thinking of buying, they are not all as efficient as each other. They will each have their own advantages and disadvantages too so it is always worth doing a bit of research on which to buy before you go and hand over your money. You will want to make sure that you are not only getting an alkaline jug that produces good quality alkaline water but also one that is good value for money, will produce a good amount of water and is not overly expensive when it comes to replacing the filter. As always, we have done our best to make this laborious task of choosing the ideal model much easier by giving you our very own recommendations. Having tested each of these alkaline pitchers extensively, we can safely say that these are among the best five on the market today. They will all ensure that your tap water no longer has those nasty impurities and will instead bring you some impressive health benefits. Interested to learn more? Then let’s get started with our reviews of the 5 greatest alkaline water pitchers currently available before giving you some sound advice on these awesome jugs via our buyer’s guide at the end. Take a quick look at how the top 5 pH enhancing pitchers compare in the comparison table below. We discuss each model in more detail a bit later. Find out a bit more about each model and exactly what we think about them. Let's start with our favorites. Let's get the ball rolling with our personal favorite. The pH Restore jug has some of the longest life filters on the market and is also one of the most effective at raising the pH of your drinking water. This product is able to remove as much as 99.9% of all contaminants from your water while also increasing the pH level of your water to as high as 10 depending on the quality of water in your area. We could not quite get readings as high as that but we were still impressed when our pH levels reached 8.9. Alkaline water has been making headlines in recent years for the potential health benefits that it can bring and thus it is no surprise that pitchers such as this one are now in such demand. This particular model is moderately priced which means it sits somewhere in the middle between the cheapest and most expensive on this list but we have to admit that we are very impressed with the quality of build, its modern design and the fact that you will be able to enjoy 360 liters of alkaline water per filter. This filter capacity is the largest on the list and means you will need to change the filters less frequently than with other models. This has the awesome effect of saving you money in the long term. Of the contaminants that the pH Restore can remove from your water includes chlorine chloramine, fluoride, heavy metals, dust, bacteria, free radicals and pesticides among many others. This is done via its multi-level cartridge which uses mineral balls and carbon to help to purify the water and improve its taste. Any bad smells in your water will also be reduced and probably the best news is that you are given two filters when you purchase it. Most will usually give you one and expect you to pay out for the second. This pitcher has a total capacity of 3.5 liters which makes it ideal for larger families and the filters will provide you with around 1,500 cups of alkaline water. It is important to note the positive effect that this has on the environment as well due to each filter providing enough water to fill 8,300 bottles of water that you will now not be purchasing. Despite being quite large in size, the pH Restore will fit into your fridge door with ease so that you can chill your alkaline water to your preferred temperature and using it is very straightforward. An instruction manual is included to help if needed but many of you will be able to figure out how to use it without it. Our Final Verdict: The pH Restore is our favorite of our alkaline water pitcher reviews because of its impressive performance at a price that gives great value. You get two filters with it when most competitors only give you one and the pH levels we experienced during testing were some of the best out of the five products here. Furthermore, those extra long life filters will save you money in the long run. Second on our list of the top performing pH improving pitchers is the EHM ULTRA. Earning rave reviews among customers, this pitcher is able to filter out many of the known contaminants found in tap water, increase the pH levels of your tap water and essentially provide you with alkaline water that is thought by many to be extremely good for your health. One of the cheapest on our list, this pitcher can increase the pH level of your water up to as high as 10 with EHM claiming you will get a minimum increase of up to 8.5 from this model. That low minimum is a very decent level and is a better balance than many other alkaline pitchers will have as their top estimate. Furthermore, using its innovative 6-stage filter cartridges you can rid your tap water of many contaminants such as chlorine, heavy metals and fluoride to ensure that the water that you drink is clean and healthy. Over extended use, the EHM ULTRA will help your body retain a healthier pH balance which a little bit of research will tell you, is good for your health. When it comes to using this pitcher, it really could not be easier and they even supply a very handy instruction manual that explains each step in detail. It will take about 30 minutes to filter a full load of water but this is quite standard and well worth the wait. Once you have filtered your first 3.5 liters of water, you and the family will instantly notice how much different the water tastes compared to straight out of the tap. In total it is claimed by EHM that you will be able to filter around 300 liters of water using a single cartridge before it needs replacing which as you can imagine, is a substantial amount of tasty and clean water to enjoy. We have not tested whether that amount is true but we have not seen many complaints regarding this so can only assume that it is a valid claim. While the design and style of a water pitcher are unlikely going to be at the top of your priorities, we do have to say that this is one of the better-looking models on our list. It has also been designed with your fridge door firmly in mind so that you can keep that healthy water nice and cold. Our Final Verdict: Sporting a sleek look and being able to produce a good amount of alkaline water per cartridge, there is very little that we can say against this particular product. If we were going to be a bit picky, it would be that the replacement cartridges can be a little on the expensive side. How can we make and test for alkaline water? Check out our latest article. Next up is the Santevia Water Systems pitcher, another that we feel is among the very best available right now. Santevia is known for creating good water pitchers but this is probably the best in their range due to a number of reasons. It can provide a lot more in terms of volume of water per filter and the taste and quality of that water are right up there with the best on our list. It might not increase the pH level as high as some of the others on our list of recommendations but what is impressive is the capacity of the filter. Each filter will give you 1,250 glasses of water before it needs replacing, a number that should mean that you and your family can drink alkaline water for a good month or two at least. Available in a range of different colors, the Santevia alkaline pitcher has also been designed to fit perfectly in your fridge and has a two-liter capacity. As for the contaminants that it filters out of your water, these include chlorine, heavy metals, rust, bacteria and fluoride while the filter will also add in minerals and antioxidants. As for that pH level, you should expect to see that level raised to as high as 9.3 which is still very good although others can attain a higher level. What we like is the fact that it will not only remove the contaminants from your water but will also enrich it as well. Having tasted the water, we can also attest to it producing some of the tastier glasses of water out of those on this list. They all taste great though but this one just about edges a few of the others. 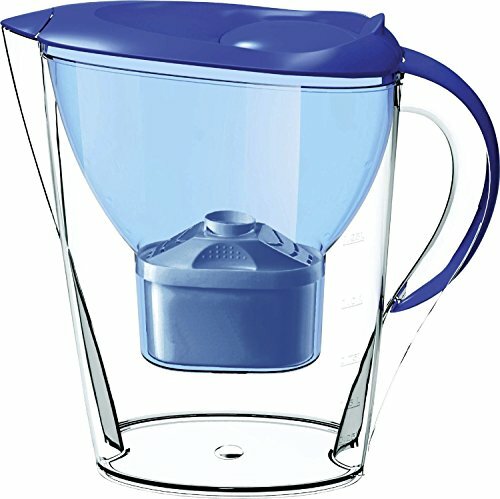 When you throw in additional features such as a timer that will keep you informed of how long your filter will last, a well-designed shape that allows it to fit in the door of your fridge and the different colors that you can choose from when purchasing, this pitcher is one that offers some really good value for money. Anyone that is looking for an easy-to-use but efficient alkaline water pitcher will not be able to find much better than this offering from Santevia. Our Final Verdict: This is definitely a pitcher that you should consider simply because of the length of time that the filters last, the amount of water each filter can treat and the number of contaminants that it removes and all the good stuff that it adds to your water. This is moderately priced with others on the list being more expensive but, in our opinion, it is well worth checking out. Recommended Reading: Don't care for alkaline water? Don't miss our guide to regular water filter pitchers. Although the Lake Industries model is the cheapest of our recommendations, it really does perform well above expectations. It has an impressive seven-stage filtration system in each of its cartridges that will remove contaminants such as chlorine, heavy metals and pesticides. Those cartridges use ION exchange resin, minerals and carbon to treat and purify the water passed through them to ensure that the water you drink is clean and healthy. Once your water has been purified and enriched, you can then drink it directly, use it for cooking, or you could even boil it to make a cup of tea or coffee. You will instantly be able to notice the difference when you taste the water and compare it to the taste of tap water, gone will be that horrid metallic taste and instead, you will be enjoying crisp, clean and tasty alkaline water. Lake Industries have produced a number of good quality alkaline pitchers over the years but this one is the best of them all in our opinion. It has a sleek design that allows it to be stored in your fridge door easily, is very easy to use and you should be able to get about 150 liters of water out of each filter. The latter is not as high as most other pitchers on this list but its price tag helps to make up for this. With a capacity of 2.5 liters and a filter that will usually last a month on average before needing to be replaced, this alkaline pitcher really does represent good value for money. Even the replacement filters/cartridges are reasonably priced compared to many of its competitors. Some cost double what the replacements for this pitcher cost and you can even save more money by buying them in packs of four at a time. A little let down is that it seems to be a little on the flimsy side but as long as you take good care of it we are sure it will last you a good while. The lid, in particular, should be opened with care as it is not the sturdiest that we have seen. All that said and done, however, this pitcher scores some very good pH levels and is well-deserving of a place on our list. Our Final Verdict: While there are others that we have recommended that we feel are slightly better than the Lake Industries Water Pitcher, this is still a very good option for you to consider. It is cheaper than all of them and still produces high-quality alkaline water. It could perhaps have a better build quality but again, you are compensated for this with the price. 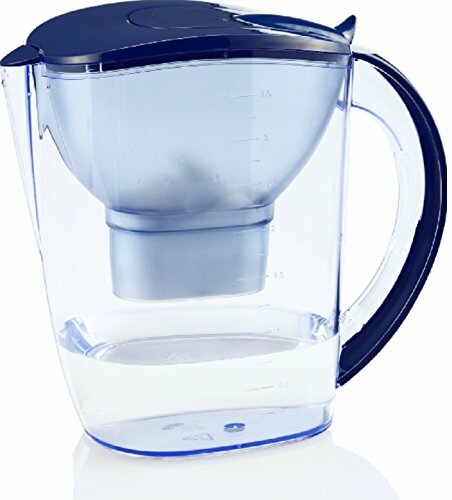 This is a great choice for those of you that are new to alkaline pitchers and wanted to try one of the better lower-priced models on the market today. 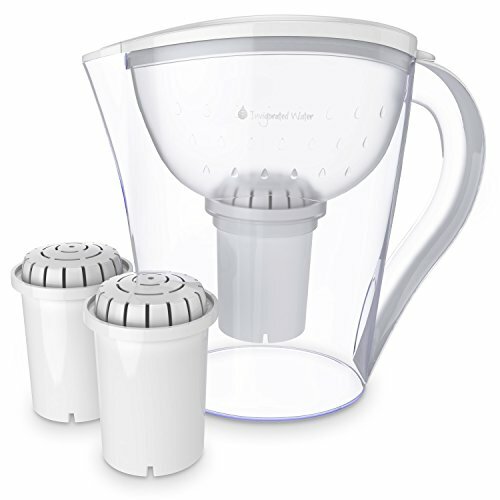 While this is the last recommendation our list, we feel that it is among the best alkaline pitchers we have reviewed. 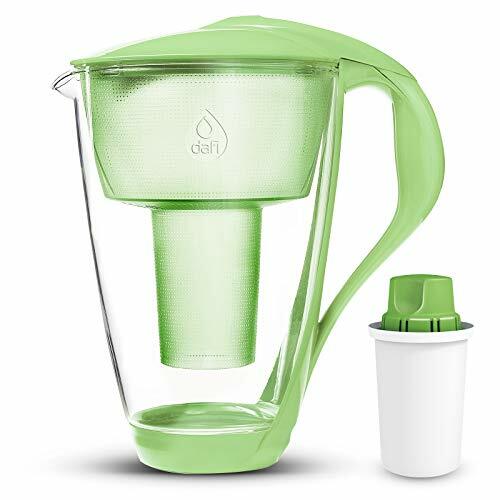 It might cost more than most but when you consider the quality of the water produced and the number of additional features that it has, the Dafi pitcher is well worth that little extra. Tap water has long been known to contain contaminants that could be having an effect on our health and one of the most efficient ways to ensure that you are not consuming these contaminants is to purchase an alkaline water pitcher just like this one. If you have done your research on the many benefits of alkaline water, you will have learned that it can slow down aging, provide your body with much-needed antioxidants and even help to prevent serious diseases such as cancer. You can use this Dafi model to filter your tap water, increase its pH levels and essentially give you alkaline water that has all of the above-mentioned benefits. Currently the most expensive across our alkaline water pitchers reviews, this model will be able to increase the pH levels of water to as high as 9.5, a big increase on the average pH of tap water of 7. This will provide our body with a more balanced pH level and bring along with it a plethora of health benefits. Each cartridge/filter will generally last about 30-days and will provide you with around 40 gallons of alkaline water. This is a decent amount although some pitchers on our list do last longer and provide more water for your money. That said, the replacement filters are cheaper than most on this list which goes some way to supplement this. One aspect of this glass jug that we really like is the LED counter and a downloadable app that will both tell you when it is getting time to replace those filters. This is a far better way to find out that the pitcher is no longer effectively treating the water compared to tasting the difference for yourself. 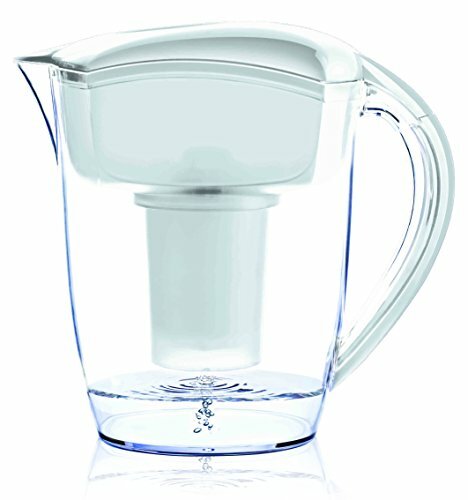 If you are worried about the contaminants in your tap water and what they might be doing to your health, an alkaline pitcher (that doubles as a water filter) is something that you really should buy and we would certainly recommend that you take a look at this one before making a final decision. It is well designed, has an impressive build-quality and will consistently deliver water that is going to improve your health. Our Final Verdict: More expensive than most but still deserving of a place on our list the Dafi jug is definitely one you should consider. It has some excellent additional features such as a timer and the pH and ORP levels that it can bring to your water are extremely impressive. It doesn’t produce quite as much in terms of quantity compared to others but the cheaper replacement filters go a long way to making up for this. Recommended Reading: Check out our guide to the top performing filtered water bottles. So that concludes our recommendations when it comes to pH enhancing water pitchers and from those, we are certain that you will be able to find the ideal pitcher for your family. All of these pitchers are great at what they do and whichever one you choose will ensure that your previously unhealthy tap water will be transformed into extremely healthy alkaline water. So, which is the best alkaline water filter pitcher on our list? All them are great but if we really had to choose one purely on performance, we would have to go for the pH Restore pitcher. You guys might get different results but it gave us the highest pH level of all that we tested and we were also impressed at how many cups of water it can provide per filter. Finally, if we were to choose what we thought was the best value for money, that title would go to the Lake Industries pitcher. In fact, we were very close to choosing this as our favorite overall but the pH level we recorded was not quite as high as with the pH Restore. That said, in terms of bang for buck, this is definitely the best on our list. If you are new to alkaline pitchers and are not sure what you should be looking for exactly, this buying guide should give you all the information you need before ultimately making a choice. Here you will learn more about what alkaline water filter pitchers do and what considerations you need to think about before buying one. Simply put, an alkaline water filter pitcher will remove contaminants in any water that you pour into it so that you are left with water that is cleaner and better tasting. Tap water is not known for being of the best quality and could contain contaminants such as heavy metals, pesticides and even unfiltered general waste pollution. As you pour your tap water into the pitcher, it is sent through a filter that will remove those contaminants and increase the pH level of your water quite substantially. Tap water usually has a pH of around 7 but using the best alkaline pitchers can increase this up to as high as 10+ in some instances. Aside from the obvious health benefits that can be had from using an alkaline water pitcher, you will find that there are some other great benefits too. By increasing the alkalinity of the water that you drink, an alkaline jug will help us to maintain a healthier pH balance. Tap water usually has high levels of acid contained within it and when this is added to those already in our body due to stress or working long hours at work, it creates an unhealthy pH balance within our body. Alkaline filtered water goes a long way to providing a much better balance. If you have drunk tap water before you will probably have experienced that metallic taste that can come along with it. You can instantly tell that you are not drinking good quality water as it does not taste too good at all. Alkaline filtered water simply tastes better due to being filtered. In the long term, one of the best alkaline water pitchers will be cheaper than buying bottled water. It is recommended that adults drink at least two liters a day and that can add up in your household depending on how many people are in our family. Once you get past the initial outlay, going forward you will only be buying replacement filters which will be able to produce far more healthy drinking water for your money than buying the same amount of water in a bottle. It is important to note that not all pitchers like this are equal and that you will have a number of considerations to make when choosing one. Some are known to perform better than others, others will represent better value for money, while others will have a larger capacity. The amount of water that your pitcher can hold will obviously be a big consideration and you will find that you can get them with capacities ranging between 1 and 3.5-liters. The size of your family, how many people are likely to use it and whether or not you plan on taking one on your travels will determine the capacity you go for. Have a big family? Then you are likely to need a larger sized pitcher but if you want something that is more portable you might want to go for something smaller. Most of the better pH improving jugswill make use of multi-stage filters rather than single filters simply because these perform better. In fact, the more stages that a filter has, the better quality water you are going to be able to enjoy. Not only do these filters remove harmful contaminants but they also add soluble minerals which are responsible for increasing the pH level of the water inside. When we talk about the capacity of a filter in an alkaline water pitcher, we basically mean how much water each filter can treat before a new one is needed. You will find that on average most filters will last between a month and three months at a time. When purchasing a pitcher, how long their filters last should be a big consideration simply because replacement filters can actually be quite expensive. We touched on the fact that tap water usually has a pH level of around 7 but some of the best alkaline water filter pitchers will be able to increase that up to at least 8 or 9 and in some cases 10. The higher the pH level, the healthier the water you will be consuming. Price will always come under consideration no matter what product we buy and this is certainly no different with alkaline jugs. While having the most expensive price tag does not necessarily mean a pitcher is the best, on average you will find that they are better than those that are half the price. Many of the top end water pitchers will have additional features but these are not always seen as anything too important. Timers or counters, for example, can be found on some models that will let you know when it is time to change out your cartridge. If you feel that these features are worth paying a little extra, these might appeal to you. We really do appreciate you taking the time to read through our extensive alkaline water pitcher reviews and this buying guide and do hope that you have not only learned more about alkaline water and the pitchers that produce it but have also decided on one of the above to purchase. While there are many other options out there to consider, we really feel that the five we recommend are going to give you the best quality alkaline water for your money. Don't miss our comprehensive guide on inline refrigerator filters next! Be sure to follow us on social media to stay up to date with all the latest news.